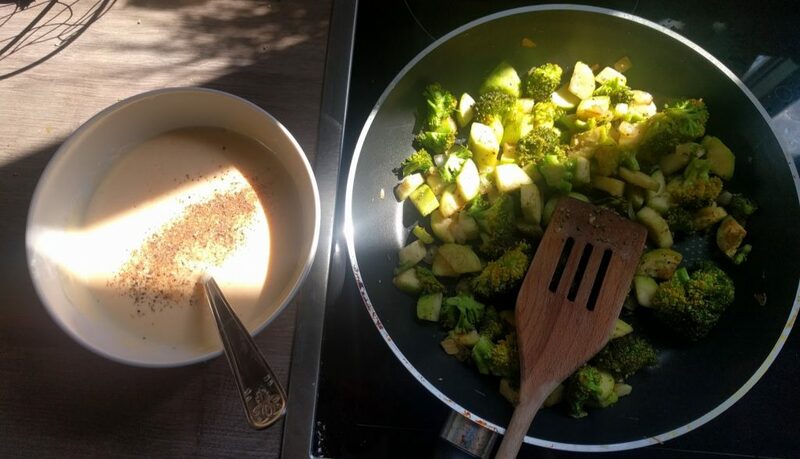 Hello all, I hope you had a nice Easter weekend! Mine was mostly dedicated to music, and especially today, when I run the second edition of my crazy songwriting experience. Plug your headphones and get ready for a sweet French story! That’s why I cheated once again for the language, and directly picked French for the lyrics of our future song. We knew that would be the best option to write a nice text together. The dance we picked up was “avant-deux“. I have a fun story with that dance, I actually hate dancing it. But let’s start with the beginning. In Bretagne, there are hundreds of different dances, different versions of each dance. These versions are often attached to a specific place, a small area or even one unique village. The “avant-deux” and all its versions come from the area of Rennes, the capital city of Bretagne and place where I spent ten years of my life. This dance was danced very often in the concerts, it is the local dance. We got mostly inspired from the “avant-deux de Bazouges”, you can see how it looks like. We also listened to this tune, well-known by the dancers, and to get a different style, this unforgettable song by Beat Bouet Trio. For the lyrics constraints, chance brought us “mythology“. We’re both interested by all kinds of mythologies, legends, traditions, so this was quite inspiring. For the music though, we struggled a bit – and to be completely honest with you, we cheated. Twice. The first random picking brought “punk”, and even if I liked the challenge to play celtic-punk music with only a harp and an acoustic guitar, we wisely decided to put the punk back in the bag. The second option we picked up was “tropical/Creole”. This is a style I put on the list just after coming back from traveling on the French island La Réunion, and at that moment it made totally sense to include this style in my options. Now, I’m not sure anymore, and I’m even wondering if I would not perpetrate some cultural appropriation by taking the music style of a culture I almost don’t know and don’t belong to. Anyway, we decided to pick again. And we got “Céline Dion“. 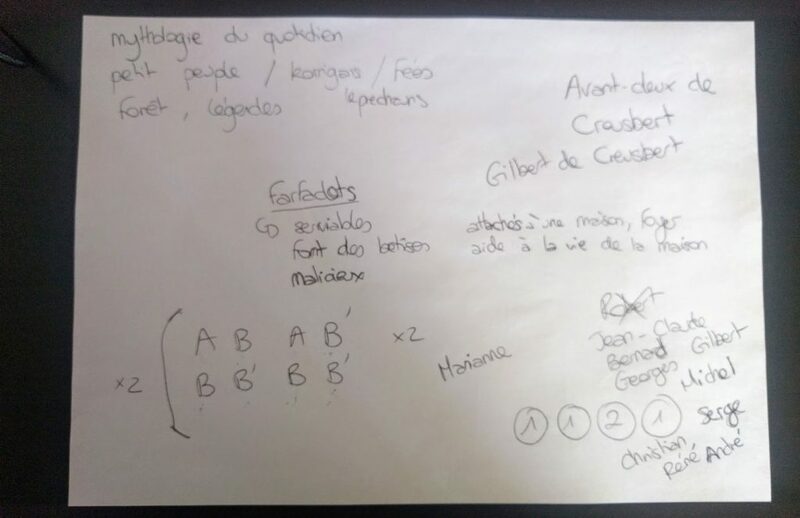 Before you start laughing or wonder if we really planned to imitate the voice -or accent- of the famous Quebecer singer, let me explain what I meant when writing this constraint: this was mainly about a composition effect that appears a lot in Céline Dion’s songs. The song starts on a quiet and low tone, and at some point, the voice raises, delivering all of its power, in a very dramatic effect. This is what I wanted to reproduce, this was our constraint. Each letter being a very short piece of music, four bars. B and B’ being very similar melodies, but B ends in a very open way (and usually on a chord IV or V), B’ really marks the end of the musical sentence, and ends up on the chord I. The dancers need two times repeating this whole part to achieve their choreography. After two or four repetitions of this whole part, the melody usually changes to something slightly different, on the same tune, and following the same exact structure. You can hear it clearly on that video. The chords are usually very simple, no weird change of tune here, no complex 7-notes-chords, just the basic I-IV-V, added with a few minor equivalents to give a bit more interest to some parts. When we listened to several videos of avant-deux, we got the feeling that this dance in particular is very connected to the countryside, the peasant daily life, the farmer environment. Not only the lyrics are usually about simple stories or things happening in the countryside, but even the general feeling of the music and the dance. Sabine and I both grew up in the countryside, and we started making jokes and imitating accents from our respective regions. This was a fun moment and also oriented our thoughts in this direction for the atmosphere of our song. A lot of variants of the Breton dances are named after the area or village they have been created in. In “Avant-deux de Bazouges”, Bazouges is the name of the village. We were thinking that since our song would be created in Kreuzberg (the district of Berlin where I live), our future piece should be called “Avant-deux de Kreuzberg”. Then we laughed thinking that most of the French people would probably not pronounce this name the German way, so we should better adapt it directly, and this became “Avant-deux de Creusbert”. Even before writing a single note, our song already had a funny name. 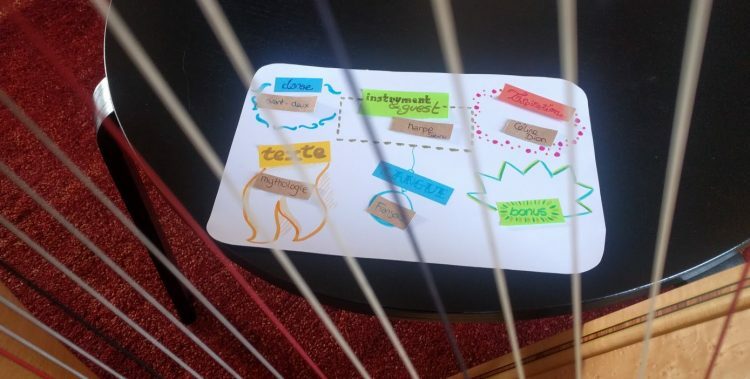 Inspired by all this, Sabine started playing a few melodies with the harp and here’s where the magic happened, she found almost immediatly something that would become our baseline. The rigid structure of the avant-deux didn’t block us too much, it was actually a way to stay on track with simple melodies. Finding chords for these was quite easy. In the same time, we were thinking about our “mythology” constraint. Since the idea of the daily life of the countryside was quite present in our minds, we decided not to talk about gods or goddesses, but to find something closer to the people, something more in the direction of legends, fairies, superstitions. Something like the korrigans in Bretagne or the leprechauns in Ireland, funny and facetious creatures that can also be mean if you don’t treat them well. Another equivalent in the French folkore was farfadets. Basically, these are small creatures living in the woods or serving in a house, helping in the fields, but also doing tricks and jokes, especially if the humans don’t treat them well. We decided to base our story on these nice but joker creatures. We were ready to start writing the lyrics! We started with our idea of farfadets and how they influence the life of normal people, like farmers in some old times. We soon came up with a few characters: “Gibert de Kreuzberg”, the farmer and father, who wants to marry his daughter, Marianne. She doesn’t want to get married, or at least not to someone that her father chose for her, she’s smart, curious, and looking for freedom and traveling. The story would be based on the attempt of the father to match her daughters with men from the village, but each attempt would be frustrated by the jokes of the farfadets. Writing the text took way longer than expected. From around 12:00 to 18:00, we struggled on writing sentences and rhymes, finding the good progression for the story, good twists, changing from idea A to B then back to A again, looking for proper vocabulary and time concordance. That was truly exhausting, we were sometimes arguing on what to write, or blocking for long, long minutes with absolutely nothing coming to our heads. But after six hours of hard work, we got our story told. Later, we would like to add more harp, it is not really present right now in the song, even if the instrument was decisive on our first steps of composing. We will also add another melody to sing, a second voice to make instead of singing unisono. Finally, maybe a drum would also be nice. In the end, after 9 hours of intense work – the same amount of time as the previous experiment, we’re both very happy and exhausted. 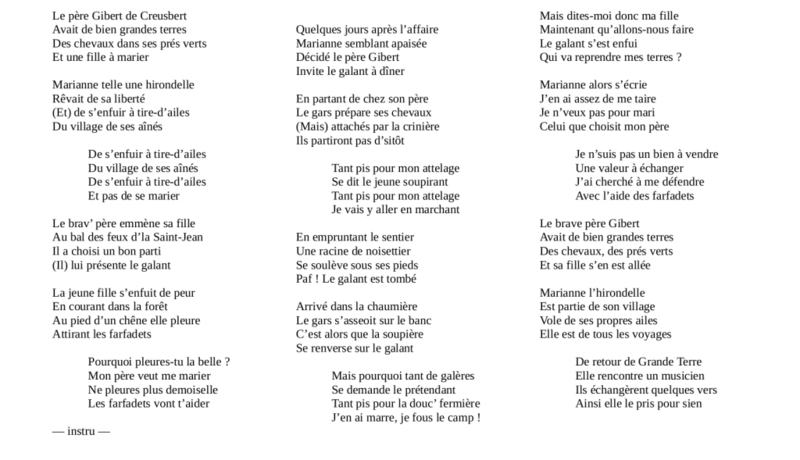 And you can be sure that we will sing this song on stage very soon with Morgane et Mélusine! Blog post pictures: CC-BY-SA Auregann. Music & text of Avant-deux de Creusbert: CC-BY-SA Morgane & Mélusine.